First off I hope you all had a great Thanksgiving. We sure did. We spent the holiday in NYC. The parade was the highlight of the trip. It was a once in a lifetime experience for us. The kids loved it, but I don't think I have it in me to do it again. Here I am with my sisters saving our spots at 6am. Notice it's still dark outside and very cold. I've been running non-stop since we got home getting ready for Christmas and our annual Santa party, which we had over the weekend. I have a couple days to relax until we start our Chocolates. Letting the kids decorate the tree before bed so I can redo it while they sleep. This is our droopiest tree ever, but I still love it. A closer look, it's covered in Santa ornaments to go with my Santa collection. The tree was too tall and we had to cut off the bottom. My sweet sister-in-law cut off the branches and made these awesome swags for me. Did you notice the packages under the tree? They're our 12 days of Christmas presents. I've used the same wrapping paper for years and ran out last year. I had to come up with a new look and love how these turned out. I used my Silhouette to make the tags. I love that machine. You can check out my holiday home tour from last year HERE. I sure do miss you guys. I hope to be back blogging on a more regular basis, but don't want to make any promises. I'll do my best. Wow! What a wonderful Christmas experience! I love your tree - it looks so traditional! that is so awesome that you were in NYC for Thanksgiving and went to the parade! I lived there for five years but never once went to the parade. I guess I was too wimpy to sit out in the cold. I SO regret it now that I don't live there anymore! Your home looks beautiful! 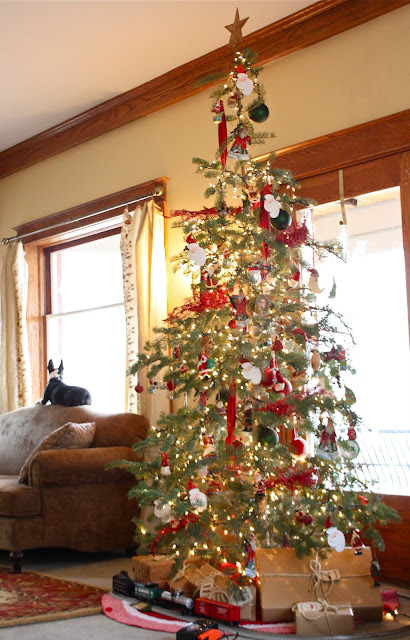 I love your tree and I can totally relate to the redecorate-the-tree-once-the-kids-are-asleep thing! i miss you too! i know you are a busy woman and that your family comes first (as they should!) but I do hope you will be able to blog more next year. you are missed! !